This entry was posted in Any Occasion Cards, Cards, Friendship Cards, Get Well Cards, Papercraft, Sympathy/Support cards, Thank You Cards, Thinking of You Cards and tagged cardmaking, diecutting, Distress Ink, fallwinter2018clh, handmade cards, Hero Arts Kit-tea, Hero Arts Tea Party, Hero Arts To Seize or Not to Seize, heroarts, Holtz Distress Inks, ink blending, Life is beauteaful, NeverStopMaking, papercrafting, Papercrafts, rangerink, Spellbinders, Spellbinders Floral Ovals, Tea, Tea Lovers, Tea shop, Your Next Stamp Coffee & Tea Border, YourNextStamp by dannscraftingwhims. Bookmark the permalink. Stunning color combo, D.Ann! 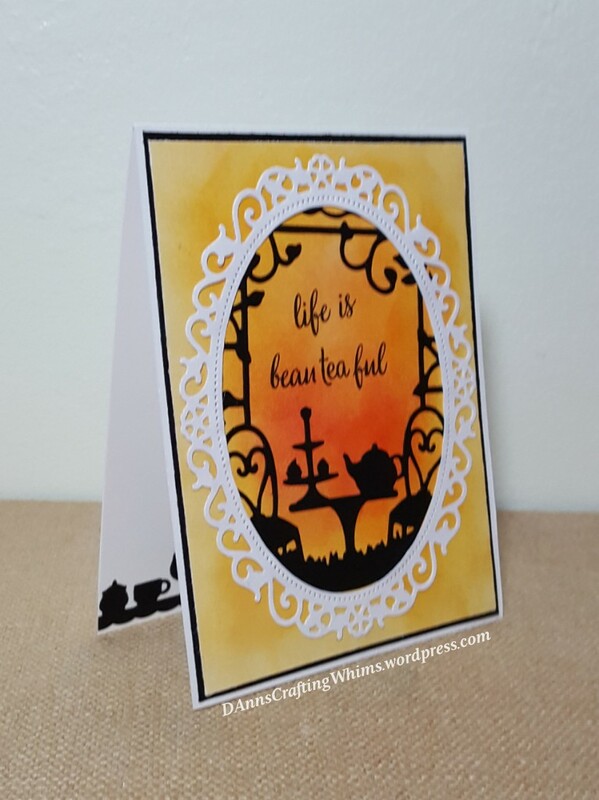 Loving the silhouettes and the frame die cut. This is so very lovely, D.Ann!! The black silhouettes against your beautiful blended background and ornate frame……are all so elegant and gorgeous!! 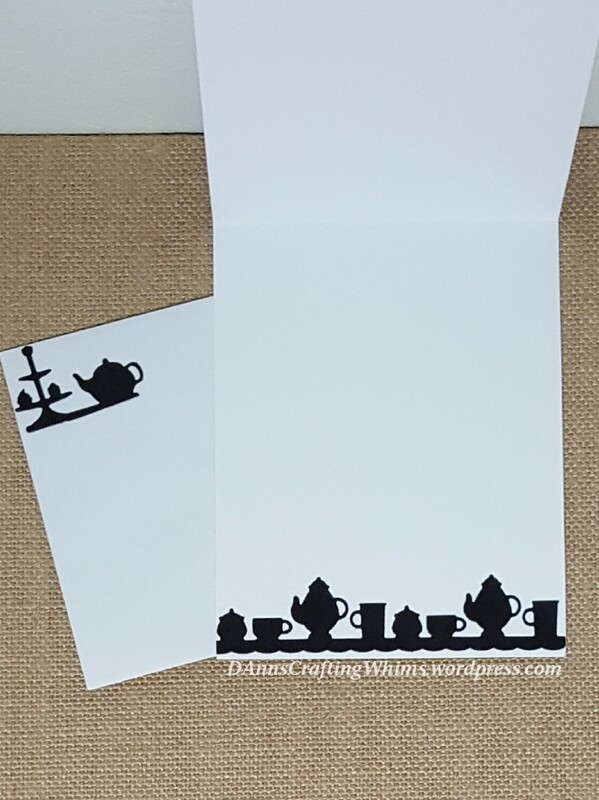 Yay for stamp surgery…..to make the perfect sent-TEA-ment. 🙂 Love the added pieces inside the card and on the envy, too. Thank you for sharing this gracious card with us. main reasons I bought the kit; love it. I love the gorgeous background color on your card! Beautiful! Lovely card and beautiful colours! Pretty card. Great inside design. Lovely card. I like the Fall colors and the coordinating envelope and inside. Well aren’t you the clever one D.Ann!! I love your warm, color-blended background and matching envelope! gorgeous, always a fan of silhouette images. fun custom sentiment! 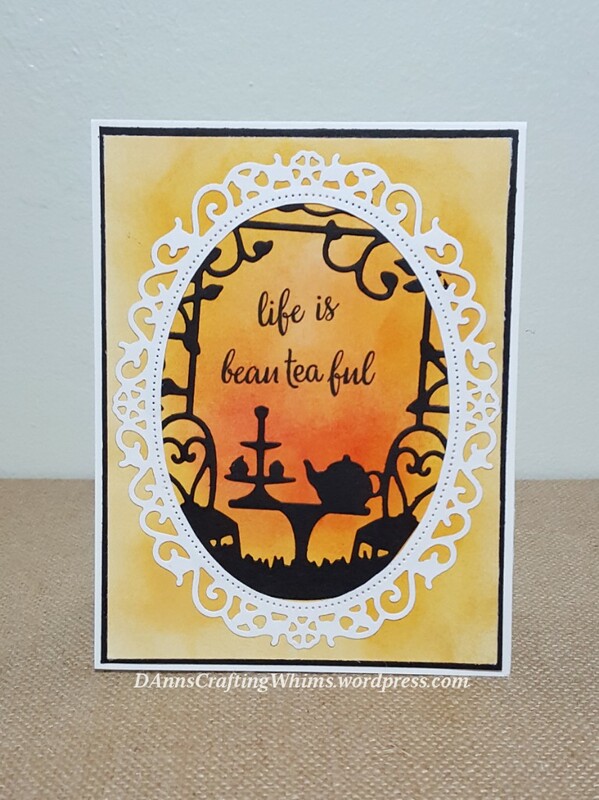 What a pretty tea card – I love the CAS design! Thanks for linking up to Cropstop! I really love this look. What a great silhouette scene you made with the dies and pretty background. Beautiful card in side and out! Such a lovely center scene, so peaceful! Wow, this is lovely. Thanks for sharing.